As a shutdown looms, the Democrats unite behind a message that Republicans can't seem to rebut. All day Friday, there were two big, conflicting narratives floating around Capitol Hill about why there wasn’t yet a budget deal to keep the government open for the rest of the fiscal year. The Republican story: We’re still bickering over how much spending to cut. And the Democratic version: False! Both sides have basically agreed on an amount to cut—somewhere in the vicinity of $38 billion. The only holdup is that Republicans still want to slash federal funds for Planned Parenthood, and that’s an absolute no-go for us Dems. Someone had to be lying, right? But who? 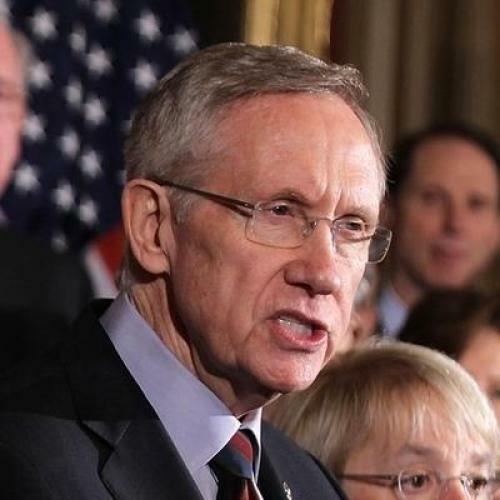 “I don’t know what else to tell you,” Harry Reid, the Senate Democratic leader, said Thursday. “Those are the facts.” Yet Tennessee Republican Marsha Blackburn sounded equally insistent on Friday afternoon: “Harry Reid is not going to be able to fool the American people any longer, because we are giving them the facts.” The debate, she insisted, was all about spending—nothing else. Reporters sighed. For the time being, the truth about just what was going on in the backroom haggling was unknowable. What was clear, however, was that Democrats were winning the spin war for the first time in recent memory. Throughout the day, the party organized impromptu press conferences to slam conservatives for risking a government shutdown over a measly $350 million in funds for Planned Parenthood. First, a gaggle of Senate Democratic women assembled in a TV studio in the early afternoon to talk up what Planned Parenthood actually does—provide STD testing and cancer screening and contraception for low-income women. (True, Planned Parenthood also provides abortion services, but federal funds are already barred from going toward that.) “This has no impact on the budget, it has no impact on the deficit,” intoned Maryland’s Barbara Mikulski. “What it doesdo is reduce opportunity for women.” And the outrage only amped up from there: "Where we will not go is eliminating the health care for women. Make no mistake, this entire debate has involved throwing women and children under the bus." Worse still, by early Friday afternoon, a number of Republicans were imploring their party to drop the fight entirely. “You know, I’d like to defund Planned Parenthood, but I understand that Republicans don’t have complete control of the elected government, so I think what we should do is cut spending as much as we can, get the policy changes that we can, but move on because there are other bigger battles that we ought to be fighting,” Pennsylvania Senator Pat Toomey said during an appearance on MSNBC. Later in the day, Mike Huckabee also materialized on TV to urge surrender: "The Republicans can't win this battle when it comes down to it." Even so, Republican House Speaker John Boehner wouldn’t come out and simply take the issue off the table. One possibility was that he was still facing pressure from within his own caucus to hold the line. But the reticence was hurting. Democrats had one unified message—the GOP is going to shut down the government over women’s health—Boehner’s Republicans lacked a coherent rebuttal. That led to one of the most surreal moments on Friday, when House Republicans assembled their own gaggle of women—15 in all—to talk about the budget. The optics were obvious: If the GOP is being accused of rank misogyny, trot out the women. But, curiously, none of the female representatives assembled wanted to talk about Planned Parenthood or the Title X family program (another rumored GOP target), even when pressed. Ohio’s Jeanne Schmidt even launched into an angry rant when asked if she personally supported family-planning funding. “We can’t tell you what we’re going to do until we see the package," Schmidt barked at a reporter, her vocal cords quavering. "What the Senate is doing is deflecting the real issue and the real issue is to cut the unnecessary spending in Washington, period! And you can continue to ask the question but the answer is cutting unnecessary spending in Washington!” Not exactly a forthright defense. Republicans, obviously, would like to keep the focus on starchy numbers and deficits, which, after all, served them so well in the 2010 midterms. But Planned Parenthood questions are now dogging them at every turn, and, if there’s no deal tonight,* they face the prospect of being seen as the party that would rather litigate the culture wars than keep the government open. As of late Friday afternoon, it’s still unclear whether the two parties can avoid a shutdown. But, for the first time in months, Democrats are enjoying a clear political advantage, however fleeting it might turn out to be. *Update: Congress and the White House did reach a deal late Friday night that did not include the GOP-backed Planned Parenthood provision.